→Top DSLR Stabilizers That Everyone Will Love! The first DSLR camera to feature high-definition (HD) video with sound was the Nikon D90, which was introduced in 2009. Initially, the entire concept of video capabilities in a DSLR camera was not taken seriously, since the market at the time had a number of very well received dedicated video cameras. However, as the technology improved in the years that followed, more and more people began to embrace the video capabilities of DSLR cameras. The technology became so good that TV shows, documentaries, and even movies were being shot with relatively inexpensive DSLR cameras. Now everyone shoots video with DSLR cameras, with the quality of the video from a technical perspective being exceptional, especially with the latest 4K technology. While camera technology plays a significant role in the growth of DSLRs being used to shoot video, so does the extensive use of DSLR camera stabilizers when shooting video. These stabilizers are based on the use of gimbals, which allow the videographer to shoot handheld with the stabilizer virtually eliminating camera shake, which is a big problem when shooting video even with lens or camera body stabilization. A typical DSLR stabilizer uses three gimbals to control the movement of the camera along the pan, tilt and roll axes. Generally, these gimbals are powered by either mechanical components or battery-powered motors. In addition, DSLR stabilizers have a variety of controls to control the camera’s position in the three axes, with the motorized stabilizers using a small computer to assist the gimbals in stabilizing the camera as well. As a result, the videographer can shoot video from a variety of perspectives while moving, with the video making it appear as if the camera is “floating”. There are a significant number of these DSLR stabilizers available on the market at a variety of price points and features, so let’s take a look at the best of the mechanical and motorized DSLR stabilizers out there! CAME-TV is a well-known Chinese manufacturer of video components including DSLR stabilizers, with the P06 stabilizers being one of the most popular, based on performance as well as the low suggested retail price of $148.00. Unlike more extensive stabilizers, the P06 does not use a battery to power the gimbals as it uses a mechanical gimbal system to stabilize the camera. The P06 is very light at 1.12 pounds due to the use of aluminum alloy, stainless steel and carbon fiber in the body. This makes its 1-handed operation easy, even for extended periods of time. Despite the lightweight of the P06, the system can still handle a DSLR and lens weighing up to 6.2 pounds. Simple, durable and affordable, it is easy to see why the P06 is so popular! * Information from the CAME-TV website, including pricing. Another popular CAME-TV product is the H4 stabilizer, which also uses a mechanical gimbal system to stabilize the DSLR. One of the unique characteristics of the H2 is it can be used with 1 or 2 hands due to the accessory handles, which allow the rig to be handled away from the body for extended periods of time without fatigue. The H2 is made of carbon fiber and weighs in at 1.39 pounds and can handle a DSLR camera and lens weighing 6.0 pounds. As with the P06, simplicity is the key to the H4, with the videographer being able to assemble it quickly in the field. At a suggested retail price of $264.00 the CAME-TV H4 stabilizer is a good choice for the videographer looking for a rig that offers the option of accessory handles for additional stabilization. Feiya-Tech is another Chinese manufacturer that makes the Feiya MG V2 motorized 3-axis gimbal stabilizer. Featuring an aluminum alloy build the MG V2 weighs in at 2.0 pounds and has a load capacity of 4.4 pounds. Like the CAME-TV H4 stabilizer, the MG V2 has a battery life of 6 hours between charges, which is much longer than the average DSLR camera battery when shooting video! The NG V2 is unique in that there is no limit stop on any of the three axes, as well as the inclusion of a joystick on the handle to position the camera along any of the three axes. The Feiya MG V2 is an advanced stabilizer, with many professional features, at a very completive price point for such an advanced stabilizer. * Information from Feiya’s website, including pricing. The Glide Gear Geranos is an American made motorized 3 axes gimbal stabilizer that performs well and is available at a fairly reasonable suggested retail price of $699.00. Featuring an aluminum alloy body the Geranos weighs in at 2.8 pounds and can support a DSLR and lens combo weighing up to 6.0 pounds. 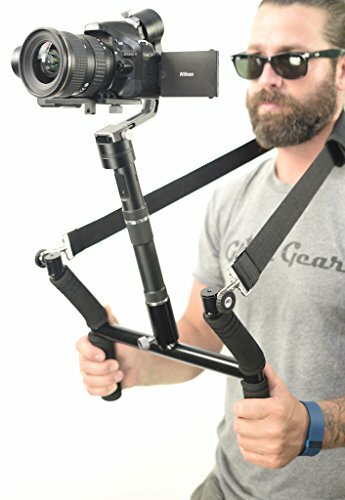 The basic unit is designed for 1 handed operation, but Glide Gear offers a handle for two-handed operation, as well as a support strap, making the Geranos the most comfortable rig to shoot with for extended periods of time. The Geranos also features a number of accessory mounting points for audio recorders, external microphones and monitoring screens for “live view” that it is easy to quickly make this light weight stabilizer not so lightweight! * Information from Glide Gear’s website, including pricing. The Pilotfly H2 is the most expensive DSLR stabilizer in the roundup with a suggested retail price of $999.00 for this German made professional grade stabilizer. Unlike the other stabilizers, the H2 uses is a 5 axes stabilizer using 5 gimbals, which make the H2 extremely stable in a variety of situations, including the inverted mode. The inverted mode allows the camera to be held just of the ground for unique perspectives, without the need for the videographer to be bent over or on their knees. Other notable features of the H2 include a very long battery life of 26 hours between charges and a tough aluminum alloy body. The H2 can be held with either 1 or 2 hands and weighs in at 2.65 pounds and can support a DSLR and lens weighing up to 4.9 pounds. Anyone considering the Pilotfly H2 should pay particular attention to the weight of the lenses they are going to be using, as it is easy to exceed the weight limitations of this rig. However, as long as you are within the limits, the quality of the video in regards to lens shake will be second to none! * Information from Pilotfly’s website, including pricing. Anyone shooting video with a DSLR camera should really look at adding a stabilizer to their camera kit. Most are very lightweight, easy to assemble and are easy to transport in their own cases. While it takes a while to initially get the camera properly positioned on the stabilizer, the stabilizer’s actual operation is pretty straightforward with a minimal learning curve. While DSLR stabilizers will not improve the content of your video, they will make a huge difference in how the video appears when viewed. Consider buying one to give your video a more professional look by making your camera appear to be“floating”!